SIGN UP FOR THE BMT FREE DAILY NEWSLETTER! I started taking wine a little more seriously the past couple of years. How could I not living out in Sonoma Valley, the best county for wine in North America? I’m very serious, though. In fact, I’m training to be a certified sommelier. It’s been interesting to learn about different “varietals” and the countries that grow them best. And it’s been fun to study geography and visit places like Tuscany and Bordeaux. The whole process has been rewarding in many ways. When you’re at a nice restaurant, for instance, you want to make sure you choose the best wine that’s going to work best with your meal, for your specific palate at your individual price point. Being able to explain your preferences and have an intelligent conversation with the sommelier, a trained wine steward, helps you do that. When I first started studying wine I quickly realized how many similarities there were between the wine world and trading. The Court of Master Sommeliers developed what they call the deductive method. What you’re essentially doing is taking into account all of the characteristics displayed in a wine and eliminating possibilities along the way as to what the wine can and cannot be. If the wine is white, you know it’s not a cabernet sauvignon or pinot noir. Then you smell it and taste it to further eliminate other varietals and work your way down from there. If a stock is making new all-time highs, we know it’s not in a downtrend. Then we look at each sector’s momentum and relative strength characteristics to further eliminate the weaker sectors from being potential suitors. We ultimately find the strongest stocks within the strongest sectors. Sommeliers consider the color of the wine, the smell, the body, the flavors and winemaking history to come up with a guess of what a particular wine could be and where it’s from. Meanwhile, we identify market trends, use momentum, relative strength, intermarket analysis, and a history of market trading patterns to isolate a specific investment opportunity. Traders and sommeliers weigh all of the evidence knowing full well that it is based on incomplete information. We trust the process. One of the weaker parts of my wine game is smell. It’s really hard for me to get those notes of grapefruit or freshly cut grass when it appears seamless for others. My fiancée is really good at this part and it totally frustrates me. So last week I took a wine aromas class at the Napa Valley Wine Academy. I was really excited to learn how to smell better but the experience really just reiterated how bad I am at this part of the wine tasting process. Anyway, one of the things that really caught my attention is the very first thing the instructor taught us: Identify your goals and decide on your process before you do anything at all. I almost fell out of my chair. This is something so basic, yet ignored by a huge majority. It’s not just ignored in the wine tasting world but even more so in the market. This is what I tell readers and Breakout Profits subscribers all the time. Similarly, when we’re tasting wine, we want to identify what we’re trying to accomplish. Are you a cooper and want to taste the outcome of oak barrels with different toasts? Are you a wine seller looking for wine that your audience will buy? Do you just like wine and want to find something you enjoy? At what price point? For what occasion? The first step is to make these decisions. Then you move on and enter your trade or enjoy your wine. Otherwise, you’re not working, you’re just having a good time. You see, in the wine world, there’s nothing wrong with that. If you don’t care to learn and just want to drink some wine and have a good time, then go for it. But in the market, there are actual consequences. We all know that guy who let a trade turn into an investment hoping it would come back. He bought a stock he planned to hold for a week after a breakout or MACD crossover or whatever his “system” was telling him at the time. Then when the trade didn’t go his way, he entered the friend zone and refused to take the loss. Next thing you know he’s listening to quarterly conference calls and is telling you about some new product or service that the company is about to launch. It’s painful to watch this stuff sometimes, but we see it every day, and not just from retail investors, but billionaire fund managers as well. They let their ego get in the way of making money, which is the only reason we’re here in the first place: to try to make a profit. The only way I know to avoid this problem is to identify your time horizon and risk tolerance before the investment is made. That way, your emotions are left completely out of it. Another important point I felt was made in the smelling class was the need for focus and silence in order to succeed. The instructor told us a story of a time we went to a winery and the winemaker took him through the cellar to let him taste different wines directly from their barrels. As fun as that might sound, he was there to work. The cleaning guy had just wiped the floor and the cellar was dark. He could not smell or see the wine properly under those conditions. For him to do his job correctly he had to take samples of each of the wines to a quiet, well lit room in order to concentrate on what he was doing. I immediately thought about a similar problem most market participants have in focusing on their goals because of all the noise they allow into their environment. Media outlets are there to sell ads to sponsors and it becomes a competition of who can be the loudest. They are competing for your attention, and some people give it to them. Many, in fact. It’s one giant exaggeration at the expense of their audience just so they can sell their precious ads. It gets really bad. 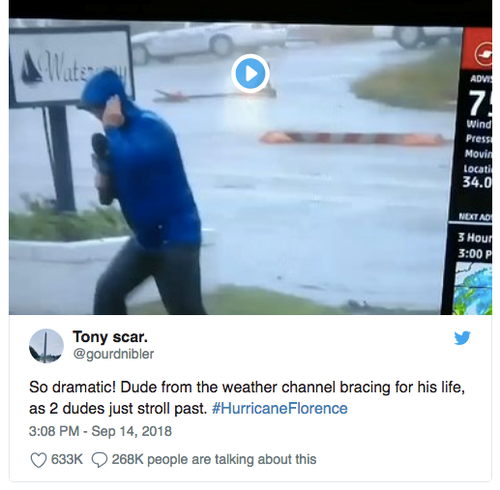 This week a weatherman was caught being overly dramatic about the wind coming from Hurricane Florence. This video is financial media in a nutshell. If we’re going to make responsible sound decisions, why on Earth would we allow that poison into our daily workspace? It makes no sense to me at all. We’re not here to be “entertained.” We’re here to make money in the market. CEOs could be lying to you or even just mistaken. Wall Street analysts and economists have opinions based on estimates, guesses and unconfirmed facts. Price is the only thing that is the actual truth we can count on. There’s nothing else. We want an environment built for success. I prefer music and price behavior during the workday. It’s a no-brainer for us. But I thought it was interesting that sommeliers agree. I do my best to continue learning, and to keep exploring and growing as a person and investor. Digging deeper and deeper into the wine world has exposed me to new ways of looking at things. The funny part is that as different as trading and wine tasting might appear to be, they are exactly the same in so many ways. This is the “idea sandbox,” where market technician J.C. Parets offers his brand of unique market commentary, thinks out loud, and shows you how and why price is the only thing that matters when trying to make money, time the market, and protect your assets.